Blessed with breathtaking views of the Manatee River and the Tampa Bay, The Promenade at Riverwalk is waterfront condo living in a sophisticated urban setting. River Dance of The Promenade at Riverwalk, is exclusive and private; yet friendly and casual. River Dance offers homeowners, from all walks of life, an idyllic lifestyle, first-class amenities, peaceful ambiance, and much scenic beauty. Designed with a Caribbean flair, River Dance's architecture blends traditional and contemporary features. All units have designer kitchens, two covered parking spots, and verandahs. All units are designed to take advantage of panoramic water views and the cooling trade winds. Landscaping is meticulously maintained to harmonize with the area’s natural beauty. Enter the secure building and you feel a world away from the stresses of daily life. The waterfront's natural beauty surrounds you. Experience remarkable sunrises and sunsets. Observe beautiful birds and Manatees. See dolphins playing and fish jumping. The palms are swaying in the island breeze. Tropical flowers are everywhere. River Dance is a haven of relaxation, unlike any place on earth. River Dance is managed by Atlantic | Pacific Management Company, an experienced property management firm, and our own On-Site Property Manager. Homeowners often volunteer on committees, such as social, amenities, website and Newsletter to keep create a friendly camaraderie among the residents. The social room is reserved monthly for a residents Wine and Cheese party. Popular movies are hosted at least twice a month in our high-definition Media Center. Walkers, joggers, and bicyclers enjoy the Riverwalk, right in front of the building. Kayaking and windsurfing are excellent and the Twin Dolphins Marina is just steps away. Socialize in our large Social Room complete with entertainment and kitchen facilities. Enjoy holiday parties, bridge playing, billiards, and dominos. Fun is Just a Step -- Or a Splash Away! Swim in the resort-style pool and spa. Watch a movie or the weekend game in our private theatre with reclining leather seating and a wet bar. Play tennis on two lighted tennis courts or play basketball or pickleball on our lighted sports courts. Practice your putting skills on our 6 hole practice putting green. Workout in our 1600 square foot fully-equipped exercise room or go for a run on our roof top jogging track. Or, simply, watch an amazing Riverfront sunset with friends. We are literally surrounded by the South Florida Museum, the Manatee Arts Center, and the national award-winning Manatee Players. 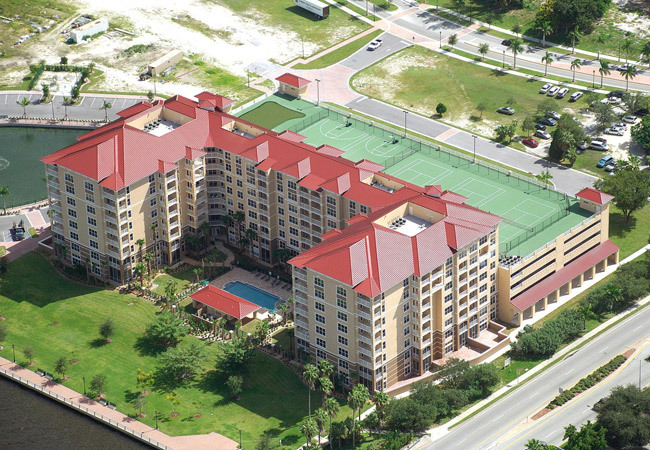 We are right on the Bradenton Riverwalk with public day docks and are walking distance to several marinas and restaurants. We are Close to all assets of Sarasota and Bradenton. Downtown Sarasota is only 25 minutes from the oasis of River Dance. More than 50 golf courses are located nearby. Enjoy Bradenton, Sarasota and Tampa art galleries, theaters, symphony, ballet, opera, and sports venues. Shop at St. Armand's Circle. Three airports - Sarasota/Bradenton, Tampa, and St. Petersburg make travel easy. World-famous powdery-white sand beaches of Longboat Key and Anna Maria Island are but minutes away.